The phenomenal results of last year’s annual fund testify to the great strides we have made in building a culture of philanthropy at Walker. Parent participation rose twelve percent (12%) and the total amount raised increased by more than fifty-six percent (56%)! Everyone at Walker is thankful to Lyric Resmondo and her team of parent volunteers who helped spread the word on the importance of a strong annual fund. Interestingly, though, the success of last year’s annual fund has led to an important question: How does the annual fund positively impact my child’s experience at Walker? It is an excellent question. There are several facets to consider when answering this question. First, The Walker School’s operating budget is ninety-five percent (95%) dependent on tuition dollars. Without an annual fund, the school would be totally dependent on tuition dollars. The National Association of Independent Schools recommends that schools operate based upon eighty-five to ninety percent (85-90%) tuition revenue. As our annual fund increases, it will have the effect of relieving pressure to increase tuition to cover expenses. Third, because of the success of last year’s annual fund and the anticipated success for this year, our tuition increase was lower. Essentially, the increased amount raised in last year’s annual fund represented more than a one percent (1%) tuition increase. The increase made a significant difference as we planned for this year’s operational budget. Finally, I would close by noting that a successful annual fund represents a voluntary vote of affirmation by a school’s two most important customers, parents and alumni. When major donors are approached and asked to make a transformational gift to the school, a successful annual fund represents the equivalent of a blue chip stock or a Consumer Report “best buy” rating. Thank you for investing in The Walker School and for your support of Walker’s Annual Fund. As I have taken on a new role at Walker this year, one common (and very reasonable) question I hear is, “What is a Director of Studies?” Officially, my role as Director of Studies includes leading the implementation of our long-term self-study goals identified last year and leading the vertical alignment of our Pre-K through 12 curriculum. I am also maintaining my responsibilities as Upper School Academic Dean. More simply, though, I am charged with helping us take better advantage of the gift of being a Pre-K through 12 school. Being a Pre-K through 12 school means that we have students ages 4 to 18 all on the same campus being guided by faculty that have expertise in developing learners at all ages. These circumstances set the stage for inspiring interactions between students of different ages. Starting last year, our teachers have been meeting monthly in vertical teams, which include all of the teachers that teach the same subject from Preschool to Upper School. One of the main initiatives for the vertical teams this fall is to facilitate meaningful cross-divisional student collaborations. What value do these collaborative moments bring? 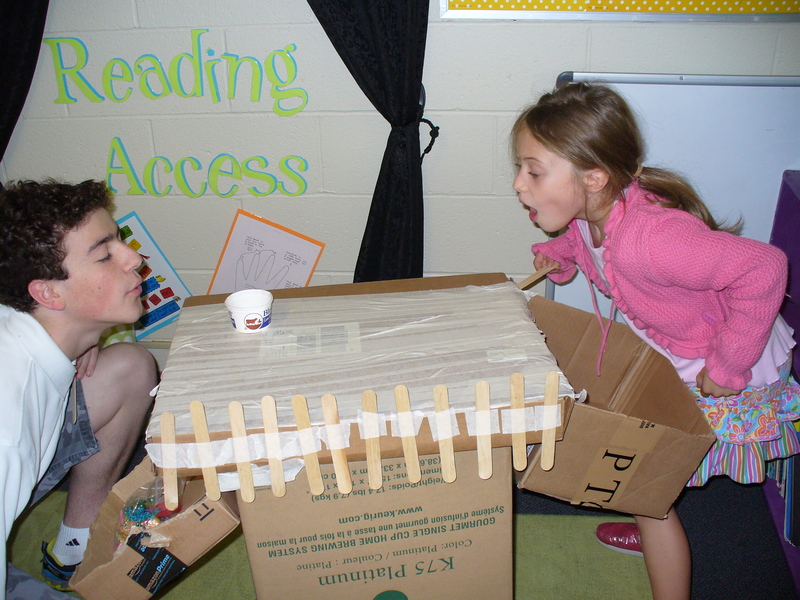 A second grade student can remind a Middle School student of the curiosity and wonder that can be found in everyday materials while they both construct cardboard arcade games that will later be played by Preschool students. A sixth grade student can apply her knowledge of grammar to mentor a first grade student as they read, write, and edit fables. Seventh grade students alongside fifth grade STEM students can interweave history and botany as they learn natural techniques for clearing weeds in preparation for planting their “culturally significant species” garden. Preschool students and Upper School students can both enhance their appreciation of music as the chorus class performs Italian arias for their young audience. 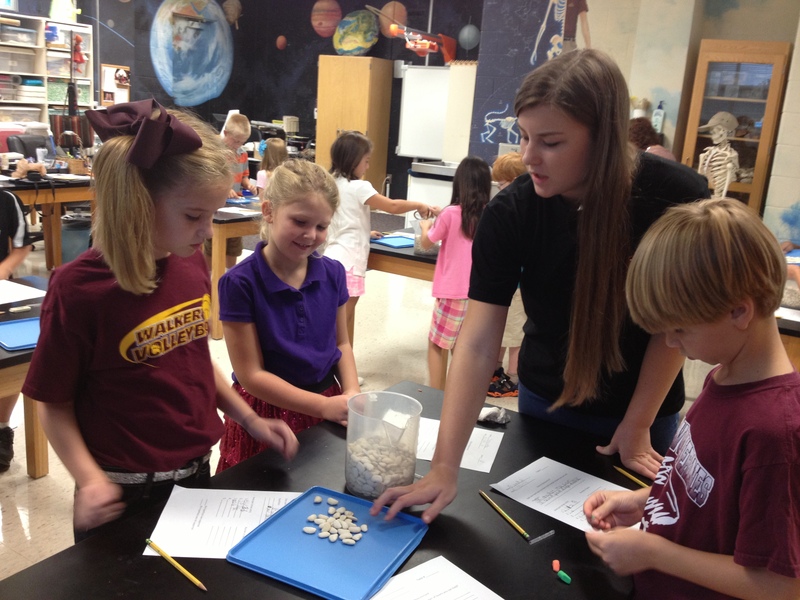 An Upper School student – in this case “Science Gabi” as she is called in Mrs. Waddington’s class – can deepen her understanding of core scientific concepts by assisting instruction in the Lower School Science Lab. As anyone who has helped their child with homework can attest, nothing deepens your understanding like teaching a concept to others. 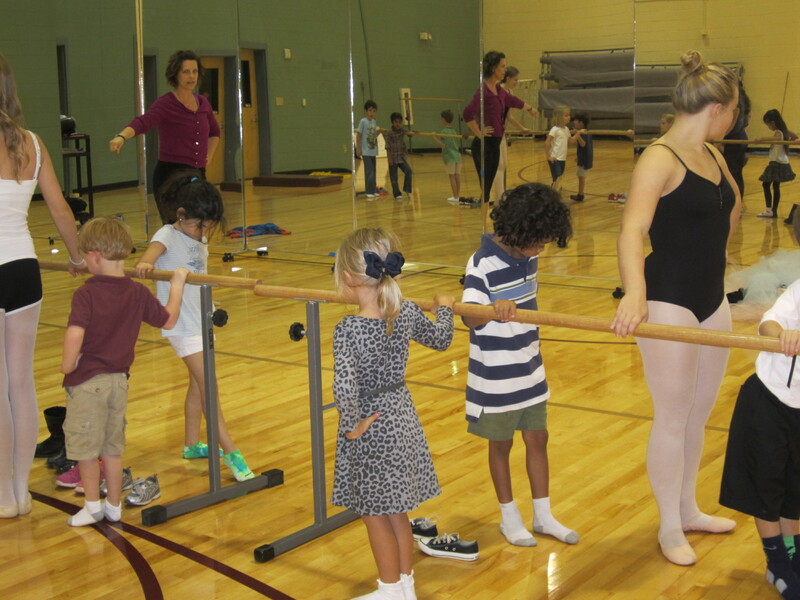 Kindergarten students can stretch their bodies as well as their minds by participating in a ballet class with the Upper School dance students. Those dancers returned to serve as models in the Preschool art class later in the week. All of the pictures above are a sample of the cross-divisional student collaborations that took place just in the last week, and they are the tip of the iceberg when it comes to the interactions that will be taking place over the course of this year. Older students are seeing themselves as mentors and role models and finding deeper understanding through teaching others. Younger students are sharing their knowledge confidently with older students – finding mentors that they naturally look up to in the process. These moments are the true gift of a Pre-K through 12 school – all students have the opportunity to learn through collaboration and shared experience. The excitement is beginning to build as we look forward to the festivities of Homecoming (Friday, October 18). The entire student body will get swept up in Spirit Week and the Upper School students will get to enjoy their Homecoming dance on Saturday night. Our football team will go out and face off against a rival in what is always a packed stadium at Robertson Field. 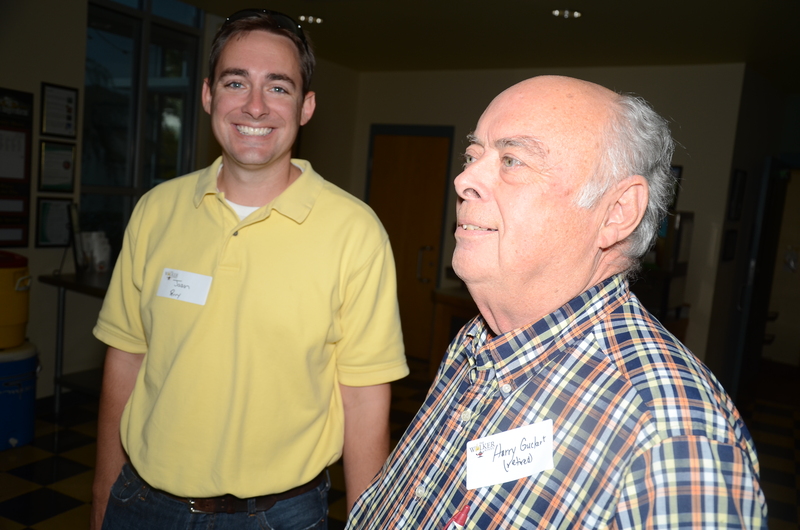 But when you trace Homecoming to its roots, it is really a time for our alumni to come home. The Walker community is comprised of several groups including students, faculty/staff, parents, trustees and more, but our largest group, by far, is our alumni. 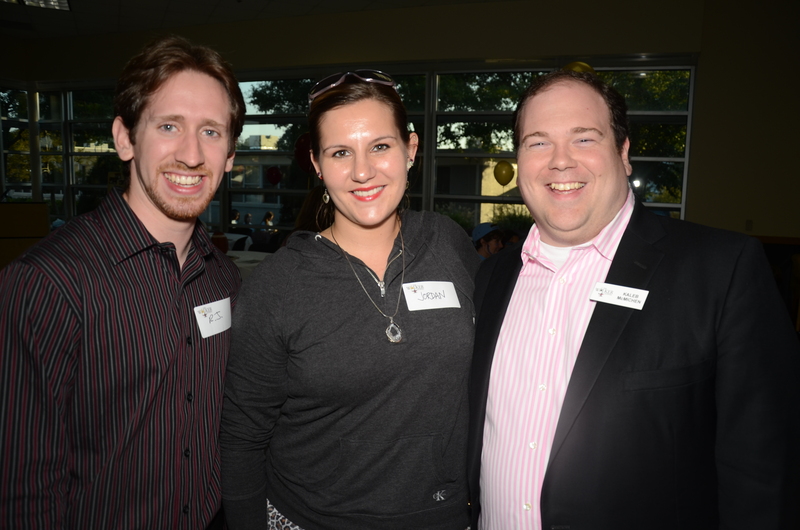 With 1,976 alumni spread out across 33 graduating classes, our alumni are a diverse group. They range in age from late teens to early fifties and reside in some 37 U.S. states and nine other countries around the globe. As one of those 1,976 graduates, I like to think that what makes Homecoming so special for our alumni is that it is a time to reflect on what has changed and, perhaps more importantly, what hasn’t changed at Walker. For those who haven’t visited in several years, the changes may seem overwhelming at first. Relatively new and expansive buildings cover a campus that is more than twice the size it was when the school relocated here in 1977. Though football is now very much a part of Walker’s fabric, it is still practically a new creation having existed for only the last decade of Walker’s more than 55-year history. Yet, what remains constant are those friends and those faculty members who, in truth, are more like family. As with any family, members grow older and new members are added as time passes, but Walker isn’t a place that people return to in order to see buildings. Walker is a place our alumni come home to each and every year to see each other and see those who have been a part of their lives for years – even decades. To put on an event the size and scale of Homecoming takes nearly a year of planning and the support of many of our school’s staff as well our Alumni Board. But what makes all the effort worth it are the scenes you see in the few photos shared here – of old friends reuniting, of children being introduced to classmates, of alumni once again seeing their favorite teacher. That’s what it means for our alumni to come home to Walker.